Our situation is desperate. We simply do not have enough expertise in the sciences for building our starship. Any effort we can make to acquire further knowledge in the field is warranted. A second Conestoga wreckage site, located in the Tsiolkovsky Hills, may yield data we need. 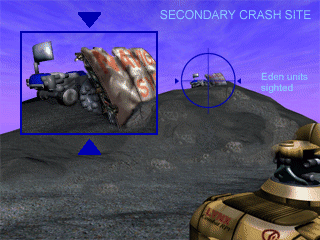 If necessary, scan all the wreckage sites with a Scout and then load any valuable pieces in Cargo Trucks. Beware of Eden units in the area. Do not let them salvage any parts of the wreckage. If they do, use the EMP and Spider combination to capture the Truck carrying the wreckage before Eden can retreat with it. Return all of the needed parts to the convoy's starting location. The Specific Objectives list may have other useful information.